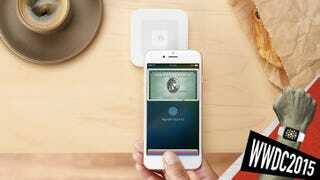 These three announcements together show how Apple is doubling down on mobile payments—and maybe cozying up to Square. So far, the adoption rate of Apple Pay has been limited by the number of partners that want to accept the standard and have the technology to do so. With this new Square-built reader, though, literally anyone can be an Apple Pay vendor now. So whether you go to Dunkin’ Donuts or your local coffee shop that uses Square’s software, you’ll be able to pay with your Apple Watch or iPhone. The new reader comes out this fall. Apple Pay is also, finally, going international with a rollout in the United Kingdom next month. That means eight new banks will join as well as a host of British retailers. The big news, however, is that Apple Pay will now work on the London public transportation system. Meanwhile, we’re still stuck will silly plastic cards on the New York City subway.